Mickey Thompson MARINES vs. Don The Snake Prudomme ARMY! Don “The Snake” Prudhomme had already become a larger-than-life figure in drag racing when he was barely out of his teens. He had outlasted 90 entries to win the prestigious Bakersfield Top Fuel & Gas Championships in 1962 at age 20 and in 1965 as well when he became the first drag racer to sweep the NHRA Winter nationals and Nationals (the only two national events at that time). 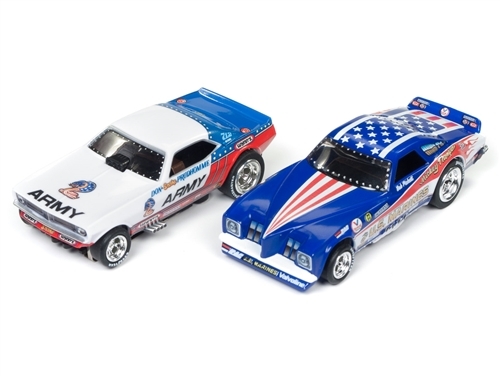 Transforming his 1973 Cuda into the Army paint scheme proved to be a pivotal moment for both the car and Prudhomme’s 1974 season, winning both the Gator nationals and the US Nationals. Prudhomme was also runner-up in the Spring nationals. 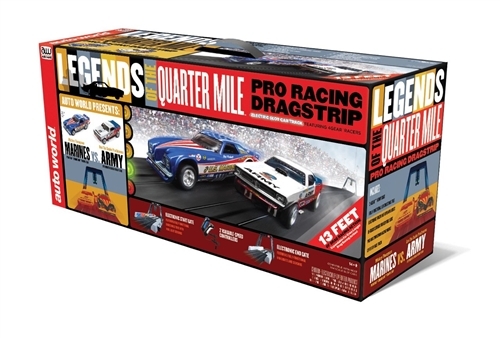 Ultimately the car came full circle, with its last race at the World Finals in Ontario, where the Cuda summed up Prudhomme’s best season at the time. Marion Lee “Mickey” Thompson was an American off-road racing celebrity. A hot rodder since his youth, Thompson increasingly pursued land speed records in his late 20s and early 30s. He achieved international fame in 1960 when he became the first American to break the 400 mph barrier with a one-way top speed of 406.60 mph at the Bonneville Salt Flats. Thompson then turned to racing, winning many track and dragster championships. Over the course of his career, Thompson set more speed and endurance records than any other man in automotive history. Mickey Thompson’s US Marines Pontiac Trans-Am driven by Larry Arnold. This was the last Funny Car campaigned by Thompson in his long drag racing career.